Vice President Biden made a visit Wednesday night to what he calls his "second city." Biden made his second visit to Philadelphia in less than a week to talk to the several hundred members of the Greek Orthodox Church whom the city has hosted since Sunday. He addressed more than 1,500 Wednesday at the Grand Banquet for the 42d Biennial Clergy-Laity Congress of the Greek Orthodox Archdiocese of America. The banquet capped the group's conference, held at the Philadelphia Marriott Downtown. The theme of the congress was "The Orthodox Christian Family: A Dwelling of Christ and a Witness of His Gospel." Though he is Roman Catholic, Biden was welcomed as though he were family. He said he thinks of Archbishop Demetrios of America, who introduced the vice president, as a man "radiating compassion" and a close friend. Biden discussed his ties to the Greek Orthodox community, comically noting that he's been called "Bidenopolis," an honorary Greek name of sorts. His speech eventually took a more serious turn, focusing on the relationship between the United States and Greece, religious freedom, and the Turkish secessionist state on Cyprus. 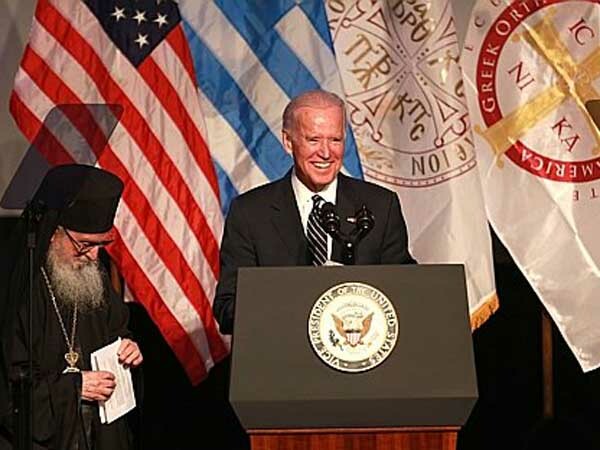 The Greek Orthodox Church, Biden said, should be "free to control its destiny" without interference from any government. He also spent a great deal of time discussing the issues surrounding the breakaway Turkish Republic of Northern Cyprus, which he said he has been working with others to resolve for years. He called the lack of movement on the issue one of the "great disappointments" of his career. But he expressed optimism that there would be a fair settlement in the near future. Biden said the parties had finally reached a point where the status quo is not good enough, and finding a compromise would benefit both.